The Volvo S60 T6 R Design is, on the surface, a simple sports saloon; all the boxes are ticked: dual-exhaust, loud colour scheme, boy racer body kit and, of course, an engine that produces over 300bhp. What you may not realise however, is just how safe Volvo have made it to have that much fun. This leads us to question; does it still class as being fun? The short answer is yes, but not in the way you would expect. With a 3.0 litre 6-speed automatic under the hood, the S60 T6 can produce a very substantial 300bhp and thanks to AWD will power you to 60mph in just 6.1 seconds- making it more than a little bit nippy. With the twin-exhaust system giving out a substantial but controlled growl it's not until you really hit the floor that you are greeted with the full roar of the engine. Sadly, because it's a pure automatic there is the tiniest of delays in the higher gears, so for those who want nothing but racing standard shift changes, you may want to look elsewhere. In the lower end it's another story with the car instantly going into attack mode the moment you turn a corner. Thanks to the masses of computing power on board and AWD you never feel like you're losing control though, which although reassuring does remove some of the connection between the wheel and the road. This is where all the magic happens. 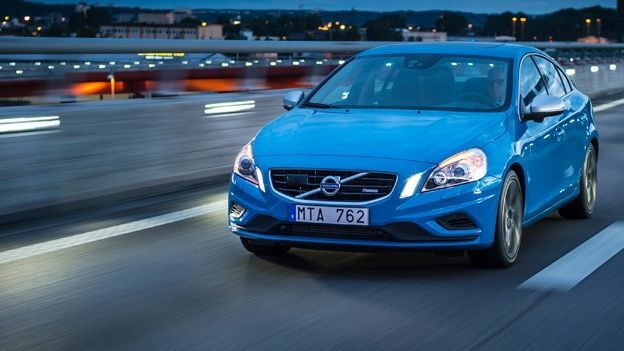 The S60 T6 is by far one of the most technologically impressive vehicles on the road today. Driver safety is the priority here and with Volvo looking to have an accident-free record by 2020 they've packed enough kit inside to make you wonder why there's a driving seat. With a front-facing radar system, the Adaptive Cruise Control will know when a car pulls ahead of you on the motorway, will slow down and then match the speed of that car until it passes or until you decide to overtake it. This is not exclusive to motorways, however. Should you find there's a queue up ahead the car will slow down, maintaining the set distance from the car in front and come to a complete halt. That radar also plays a big role in the Pedestrian Detection system which will, at speeds of up to 35kph, intelligently recognise a pedestrian and then halt the car in time if the driver fails to take action. Blind Spot Indicators do just that while a warning HUD alerts you if you're heading towards another vehicle or object too quickly. The lights are just as smart with active bending headlights that not only automatically dim from full beam when picking up an oncoming vehicle but will also recognise the rear lights of a car in front as well. The media system has also been given a similar level of treatment, with the S60 being iPhone 5 lighting cable compatible. Elsewhere there's a full Freeview TV system, DVD Player and a remote control if those in the back fancy something a little jazzier. To say we're impressed would be a slight understatement and while it may have a few shortcomings (World's most stubborn Sat Nav system and baffling lack of DAB Radio) it is still one of the best tech cars we've seen. With the 'Rebel Blue' paint and the Polestar livery on the sides this is not a car you can miss. It's an eye-catcher not in the way that you instantly wish an ASBO on its driver but in the way that makes you wonder, 'hang on, that's a Volvo?!'. Yes its competitors from BMW and Audi may well be faster and over £40k cheaper, but what they don't give you is the feeling that while you have grown up, you haven't grown up enough that you don't like the sound of a car that can practically drive itself and on top of that, makes a very loud noise.